Nimbuzz Messenger is a multi-protocol clients to talk in chat with your friends and make VoIP calls. It's free and offers the basic functions of any Internet Messenger. Few non-existent functions and emoticons make Nimbuzz a decent product, but definitely improvable. 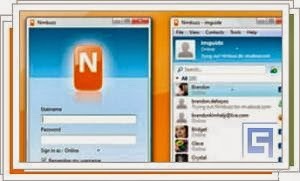 Nimbuzz Messenger allows access to other Internet messenger networks like Windows Live Messenger, Yahoo! Messenger, Google Talk, Skype, ICQ, Facebook and more. The interface of Nimbuzz is practical, easy to use. You can send text messages, files, and for protocols that support it, even talk to voice using VoIP. Nimbuzz messenger is one of the best multi-protocol internet messenger from a single interface.